The question of “What shall we eat?” is a daily struggle. Equipped with AI-based technologies, the 2018 Family Hub can answer the question. 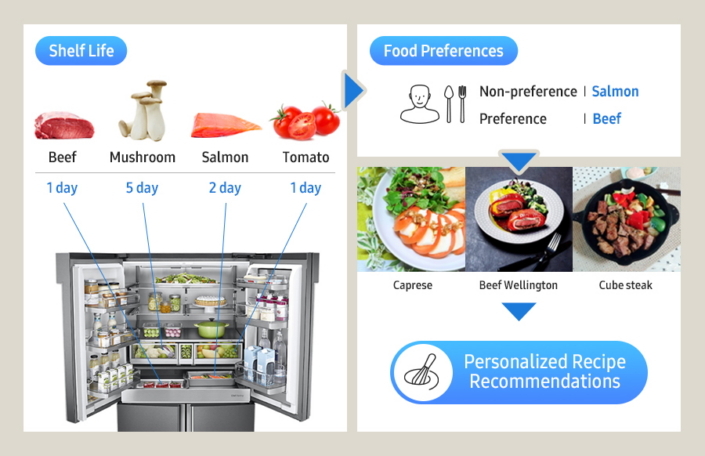 The refrigerator recognizes the user’s voice and suggests a personalized diet after considering the shelf life of ingredients in the refrigerator and user preferences. It also recommends customized services to users. Let’s look at how the 2018 Family Hub has changed in detail. Why Does the Family Hub Evolve to be Personalized? The refrigerator is the most frequently used appliance in many households. 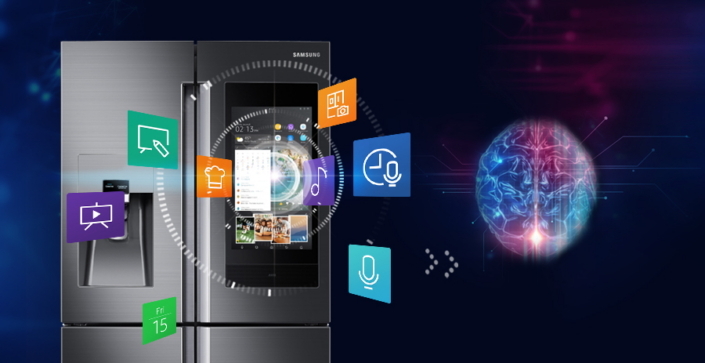 However, as the refrigerator evolves into a smart device, each family member may also want different functions and information that suit their individual tastes. So the 2018 Family Hub uses AI to offer ‘personalized’ services. The new Family Hub that will be introduced this year has a new feature called Meal Planner. It suggests optimal recipes for the user based on their food ingredient preferences and the expiry date of the ingredients in the fridge. Previous models of the Family Hub had a voice recognition feature. The 2018 Family Hub builds on that with a new VOICE ID feature that can identify a user by his or her voice. No other refrigerator on the market today supports these functions. 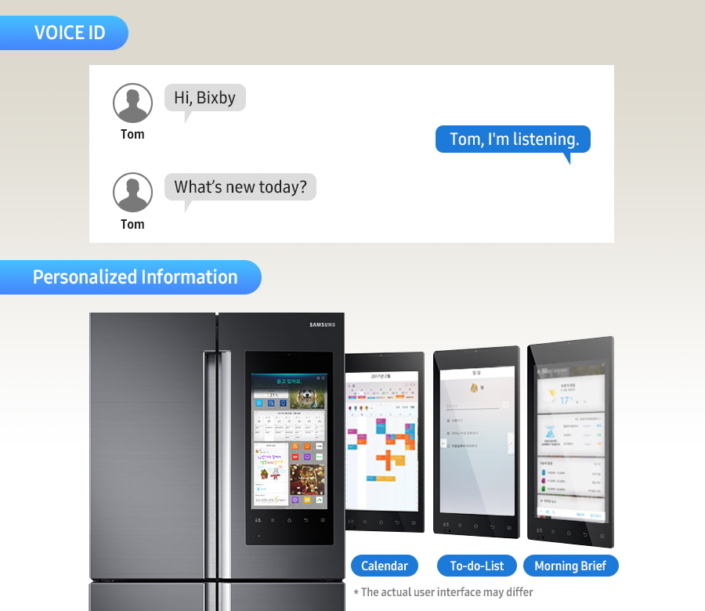 VOICE ID does more than just recognize what the user says. Previously, you had to manually enter information into the Family Hub to call up your personalized calendar or weather. Now, because it can determine who is actually speaking, it can call up user-specific information with just your voice. After registering the sound of each family member’s voice, Family Hub analyzes the voice data to distinguish the speaker’s voice from other family members who have registered their voices. When you say, “Hi Bixby,” the Family Hub determines whose voice it is based on information stored in the cloud. ”Hi Bixby” is a trigger phrase that gets the fridge ready to recognize the user’s voice and reverts to the custom settings and features for that person. Family Hub has three functions that can be personalized: Morning Brief, Calendar, and To-do List. If you say, “What’s new today?” after saying “Hi Bixby” to make the fridge recognize you, the Family Hub shows a personalized schedule. Not everyone in the family has the same eating habits or preferences. The 2018 Family Hub combines data from individual food preferences and shelf life for ingredients in the fridge to provide each family member with a personalized diet. Family Hub features a sophisticated algorithm that automatically suggests appropriate menus from a variety of recipes. The 2018 Family Hub employs AI-based technologies so that it can analyze data on each family member and selectively utilize the information. The refrigerator offers recipes that meet the needs of all family members, or provides family member A and B, or B and C, with personalized recipes. The fridge can provide a user with enough number of recipes so that the user can plan a whole week of meals. The user can select a recipe and register it to the calendar to arrange a healthy and optimized meal plan. Let’s say the mother likes beef and hates carrots, and kids don’t enjoy salmon. This information is entered into the Family Hub and the Meal Planner function proposes menu options to keep everyone happy, while minimizing food waste. The Family Hub finds ingredients close to their expiry dates first. And it rules out carrots and salmon as ingredients and offers recipes for food that includes beef. The 2018 Family Hub, which will be sequentially released in the first half of this year, will support VOICE ID. Meal Planner will be added in the second half of this year, and it will also be available on the 2017 Family Hub via software update. Samsung plans to expand the use of AI technology in other home appliances in the future, further tailoring services to fit users’ lifestyles. The 2018 Family Hub helps family members stay connected with each other and serves as a personalized device that makes our lives more convenient. The Family Hub will make a difference in the kitchen and in our daily lives thanks to AI-based technologies that help the fridge deeply understand and relate to users. Stay tuned to see how Family Hub continues to evolve.